Wind-Up Records is bringing back the SnoCore tour this year and it will be hitting Maingate Nightclub in Allentown on February 13th. The Pretty Reckless, fronted by Taylor Momsen, released their 2nd studio album, Going to Hell, earlier this year. After wrapping up the SnoCore tour they’ll be hitting up Europe to open for Fall Out Boy on their next tour leg. 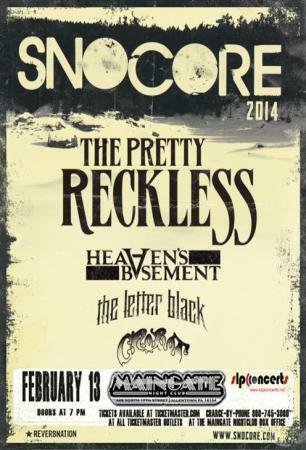 Joining them will be Heaven’s Basement, The Letter Black, and Pottsville-based band Crobot. Tickets for the show are $22.70 and can be purchased here.